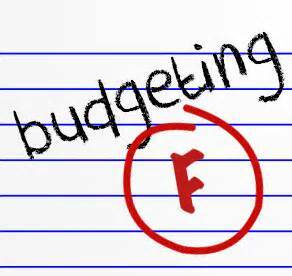 A budget is not a random set of numbers written down on paper or typed in a spreadsheet. A budget is not how much you have left in your checkbook that will get you to the next payday. A budget is not guessing how much you think you might need to get you by till next payday. A budget is not the same every single month. A budget is not difficult if done monthly and tracked daily! When establishing a written budget or cash-flow plan, you need to determine what categories are fixed, which are variable, and turn your periodic expenses into a monthly fixed amount. To start, you should list all your monthly, quarterly , periodic, semi-annual, annual and long term expenses on the left hand side of a spreadsheet. Next you want to list all the known fixed expenses next to their corresponding category, then you want to review the last six months of your variable expenses and list the average next to all variable categories, lastly you want to review all your non-monthly expenses (Periodics), determine how much time remains before that expense comes due then divide by the number of months that remain. Once this is complete, you will have a baseline budget that you can use to develop future monthly budgets going forward. At four days before the month begins, sit down and determine if any adjustments need to be made based off of last month’s expenditures. To understand last month’s expenditures, you will need to track every penny that comes in and goes out. Measure this against what you allocated for each category and adjust as needed. When you develop next month’s budget, you will need to assign every penny to a category that is on your expense list until you show zero left. This is what we call Zero Based Budgeting. Tracking enables you to see if you are staying on track with each budgeted category and will show you what’s remaining till the end of the month.